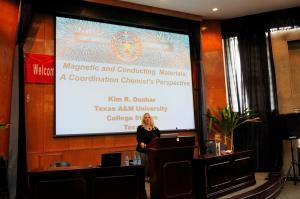 COLLEGE STATION, TEXAS, USA, April 5, 2019 /EINPresswire.com/ — Kim Renee Dunbar joined the faculty of the Department of Chemistry of Texas A&M in 1999 after serving on the faculty at Michigan State University for 12 years where she was named a University Distinguished Professor in 2006. In 2015, Dunbar received the American Chemical Society’s (ACS) Award for Distinguished Service in the Advancement of Inorganic Chemistry, the second female recipient of the ACS’s top award for inorganic chemistry in its 52-year history and has served as an Associate editor of the ACS inorganic Chemistry journal for many years. A leader in both chemical research and education, Kim Renee Dunbar is the first female Texas A&M Former Students’ Network (WFSN) Eminent Scholar Award winner. In 2012, Kim Renee Dunbar was awarded an honorary doctorate degree from her undergraduate alma mater at Westminster College in New Wilmington in 2012. Prior to that, in 2004, Texas A&M named Kim Renee Dunbar the first Davidson Professor of Science and joint holder of the Davidson Chair in Science, meriting particular distinction as the first female chair holder in the College of Science.